FLOWERS: The very odd flower structure is best appreciated under a dissecting microscope: Two small white petals, three stamens and four sepals. 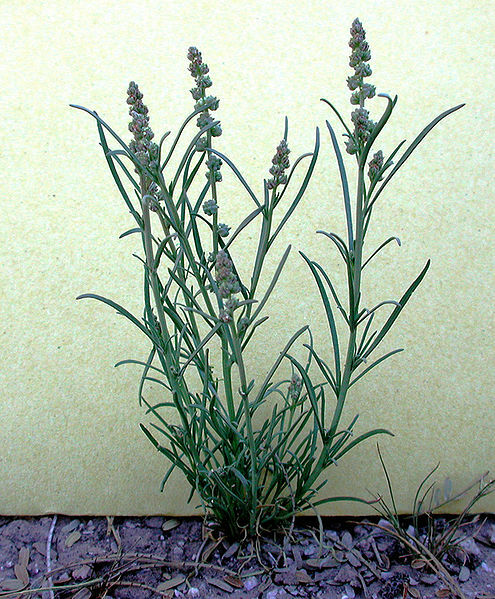 The flowers are small and arranged into a spike above the leafy portion of the plant. ANNUAL: Mostly obscure, spring annual and mostly much shorter than ½ meter tall. LEAVES: Leaves are linear and grass-like. The foliage is mostly free of hairs. RANGE: Not uncommon in the Sonoran Desert of Arizona but not showy and thus often hard to find. Present only in years with adequate rainfall. Likely habitat is sandy soil that may be alkaline. FRUIT: The capsules are four-parted with a distinct depression at the top.